Original content by Louise Stanger, Ed.D, LCSW, CDWF, CIP and, with her express permission, edited to include my professional expertise and perspective to shine additional light on the significant issue of boundaries. In our practice, we often see young parents wanting to be friends with their children. Often, shuddering to think what a disservice we have done to ours. In our zeal to give them everything we did not have, and without healthy boundaries, we have created a group that holds us hostage in their constant need for instant gratification whose emotional default demand is to swim in endless sea of “yes.” Gone are the days where using ones’ imagination reigned free and a simple cardboard box and crayons realized daytime pleasure. Daytime pleasure today is often times pushing the App button for a two-hour home delivery of a new technology device, or whatever else will satisfy one’s appetite of the requestor for happiness. Perpetually winking at us with their teasing neon message-received lights, grabbing and commanding our children’s’ undivided attention is technology that lulls them into otherworldliness and non-communication. Their little hands deftly tap into the wonder of the digital world for even a four-year-old ordering up cartoons on mommy and daddy’s phones while at the dining table at a restaurant. What does that do to relationships? How do we teach our young to speak and not text across a room, to look another in the eye and to hear the simple sounds of everyday life? What holds us hostage as our loved ones lose themselves in a drug laden sea of chemical Forget-Me-Nots? Noted child development specialist, Joe Newman, talks about the compassionate art of Raising Lions. He advocates setting consistent healthy limits or boundaries as the key to successful development. 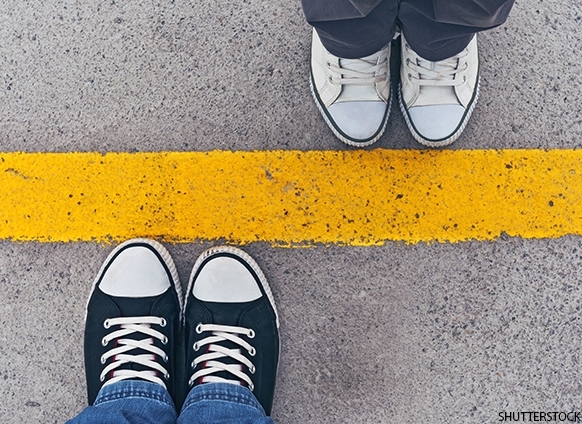 Boundaries are an interaction with another and signifies the separation of one from another. A boundary also signifies what is acceptable behavior in social discourse. If that is a boundary, then relationships are the interactions we have with others, friends, family, children, work and love. In our work as clinicians who specialize in substance abuse and mental health, we too often come across youngsters and oldsters who have had no boundaries, or ones with the resistance of rubber bands. Too often, they have long held their loved one’s hostage in the name of love. A lack of healthy boundaries often leads to many a family member who is afraid to speak except with their checkbook and who in the name of love allows their loved one run ripshod over them with endless nonsensical and ultimately hurtful demands. In this not so empty nest society we are becoming, we see mothers who return to making peanut-butter and jelly sandwiches for 34-year-olds who have moved back into mom and dad’s home, doing their laundry and not requiring them to work. We have fathers who are afraid to set limits, opening wallets for expensive concerts, clothes and toys. We have loved ones who are afraid to say “no” to their spouses, as they fear their wrath, the loss of an idealized version of marriage, withholding of income and subsequent disintegration status. Estate attorneys, business managers and agents who have poor boundaries experience the feeling of being held captive, as they are afraid of losing their client. Age is not a determining factor of whether we experience healthy or unhealthy boundaries. Recently, a set of aging parents, 88 years old, discussed the desire to save their 62-year-old son or daughter who has failed to launch in life on multiple and crippling levels. All in the name of love. Love, love, love — the stuff of which songs are sung, sonnets are written and tapestries are woven in smitten celebration. Love is the amorous adhesive that binds us to one another and in its most elemental stages mimics addiction. In its first stages, our brains experience an increase in dopamine and decrease in serotonin so our mood, like that of the addicted brain, is highly unstable. Just stop and think for a moment about your first love. Heart beating fast, pulse racing, palms all sweaty and the rest of the world irrelevant, shut out. Surely this must be that type of love that stops us from saying no? Or do we use the excuse of love to make poor decisions when it comes to our loved ones? Are we truly afraid they will never speak to us again, cry uncontrollably and throw a three-year old’s temper tantrum if we dare to utter a “no”? There have been many a parent or spouse, brother or sister, who has lost their way in their worry about their loved one. They have forgotten their hopes and dreams and locked them in a trunk waiting until their loved one improves, feeling absolutely powerless. Creating healthy boundaries will allow these feeling to dissipate. Stop and reflect on what is special about your loved one. What makes your heart jump with joy about your loved one? Was she your first born? Do you remember when he learned how to tie his shoes and put those chubby arms around you with a big hug; or his first Little League game; or her first birthday party? Look in your heart and consciously reconnect with the experiences that make your memory smile. What are your fears, your worries today? What has happened that makes your heart hurt so? What is it your loved one done or hasn’t done? Have they emptied your checkbook and left it zero, stayed out all night without calling, flunked out of school, lost their job, changed their friends, lied, cheated, stolen, or had run-ins with law enforcement? When loved ones are in treatment, families are often anxious. They want instant results, 24/7 communication with treatment providers and get angry when they do not get instantaneous results. Some families prefer that their loved one has a mental health or physical illness rather than a substance abuse or process disorder. Believe me, they get mighty angry if professionals disagree. Sometimes, in an attempt to control information, a loved one might take a clinical professional off the consent form as a way to exert control over them. When this happens, this is the time for the family to create a healthy boundary with their loved one letting them know that it is not acceptable behavior as this hampers the treatment team’s ability to help them. Getting mad at the treatment provider is not the answer. Rather, setting and holding firm boundaries is the answer. Sometimes doing nothing is the answer. The family has to trust that they have entrusted their loved one into safe and capable hands, as they themselves know they have not been successful for years. In truth, the top tier treatment centers to whom we refer must have such excellent reputations and do such great work that they do not want your loved one unless it truly is the right mutually aligned match. So, let it go. Stand back, pause and let the treatment center do the work! Let your loved one experience making his or her own bed and not ordering anyone around. The frustration you feel as a family is not that the treatment provider has failed but rather how long will it take for your loved one to join up their own dots and seek health and wellness for himself. Today it is not uncommon to meet families who overly indulge their loved ones. Affluenza has been described as having been grown up with a sense of entitlement, developing poor judgment after coddling by very indulgent parents. We hear all the time about these Failure to Launch clients that range from the early teens to the late 60s. These are folks who have never or rarely have had to experience the consequences of their behavior and who are used to doing nothing and getting their own way — whether it’s having their mothers make them a sandwich while they are high in the middle of the living room sitting in the best chair as people scurry back around to wait on them, or they have never worked and have been on the trust-fund dole and still rage like a 3-year-old at age 63. In an effort to make the world a better place for their loved ones, well-meaning parents have provided cushions they thought were soft which turn out to be as prickly as a cactus, biting them in the behinds as they are scared and held hostage by the unrelenting demands of a 5-year-old housed inside a young adult, adult and older adult body. While in treatment, it is imperative for the identified patient, client, or student to learn new ways of being. It is equally important for loved ones to get help. Sometimes loved ones are sicker than the identified clients. There is a saying “nothing changes till someone changes”. Waiting just for the identified patient to change may be pure folly if those around him/her do not change! Treatment centers must look at change beyond the standard traditional “family week” of treatment and develop practices which look at systemic long-term change. It is when we develop compassionate discipline and choose to abdicate our role as hostages and hostage-takers that we can really begin to not take love’s glorious and transcendent name in vain. You no longer have to run down Anguish Alley or Pity Path. While you may have, in the name of love, lived on Nagged Road, Raged-At-Parkway or Enmeshed Avenue, those can be tossed aside for Boundary Boulevard. Dr. James Flowers has occupied an expert leadership position in the pain recovery and addiction treatment field. He has dedicated his career to his passion, designing multidisciplinary addiction treatment programs and clinical protocols to help individuals suffering from addiction and chronic pain. Dr. James Flowers has a passion for recovery and creating positive change in lives impacted by pain and co-occurring addictive disorders.